When we disrupt customers, what do we seek to accomplish from our intentions and actions? Let’s say we are engineers offering what we perceive is an incredible solution to a perplexing manufacturing issue. Perhaps we are sales engineers who are tired of trying to substantiate over-sold sales solutions that always end up being under-delivered and over-budget. Then again, consider sales people who are so regimented to one particular way of selling that they lose lost sight of the object of their desire. Their object? No. Not closing the contract, sillies. Somehow, somewhere, serving the Voice of the Customer’s Needs gets lost in our professional training, doesn’t it? We trade-off looking at the long-term, big picture implications of our offerings. Instead, we gradually become more self-serving each time we interact with customers. Losing track of that long-term, big picture negatively impacts our efforts to create customer loyalty and implement a rock-solid customer retention strategy. It doesn’t have to be that way. Join me on June 14 at 11 am. Learn how to become more strategic and customer-centric to retain customers who are thrilled to be doing business with you. When we disrupt customers, let’s do it on their terms. After all, the customer does, indeed, know best. Now that old-school sales phrase does not translate into the customer having all the answers. Especially in complex selling environments characterizing the continuously dynamic industrial Internet of Things (IIoT) ecosystem. Yes, we just may offer an extraordinary solution that can grow, expand and sustain their business. However, we never will get from “where we are today” in customer conversations to “where we need to be” when we lose sight of two critical variables. Those variables are customer knowledge as well as the context of that knowledge. After all, root causes can have some very big contexts. The difference in our collective perception is the difference between foresight and hindsight. If our solution disrupts our customers’ infrastructure and corporate culture, they won’t necessarily be forthcoming with these insights. Consider that gleaning their insights alters our entire intention and actions when working with that customer. Also ponder our ingrained habits and how we have been trained when confronted with obstacles and objections. Instead of charging forward to substantiate proposed engineering, software or sales solutions, what happens when we take the time to ponder the unspoken context of client hesitation? Those insights about client context fuel our strategy to disrupt customers. On their terms. And on their turf. 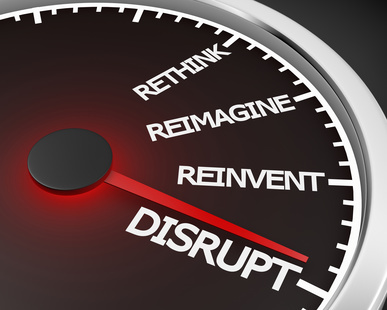 Focus on continuously disrupting ourselves in order to successfully disrupt customers. All of us have not only professional goals we wish to attain. Also, we have KPIs and quotas to fulfill, especially if and when we work for other people. As a result, we gradually become distracted from continuously targeting our customers’ voices. Instead, we listen to our employer’s voice. And that voice may be self-serving instead of customer-centric. The best way to disrupt customers is to disrupt ourselves first. Continuously. Then become comfortable being continuously uncomfortable, on our toes, poised for “What’s Next?” That professional development strategy keeps us focused on continuously acquiring knowledge that is valuable to our clients. Initially, our goal is for customers to ask us “What do you think?” instead of “Can you do this for me?” After all, the choice is ours. Are we innovators in the eyes of our clients? Or merely order-takers? Ultimately, our goal is to be invited to sit at our clients’ tables as their go-to resources, even when there is no contract to land. When we are valued as innovators, we catalyze customer loyalty resulting in a rock-solid customer retention strategy. Have I piqued your interest? Then join me on June 14 at 11 am! Learn how to become more strategic and customer-centric. Retain customers who are thrilled to be doing business with you. Babette Ten Haken writes, speaks, coaches and consults about collaborative value creation for customer retention. She humanizes the Voice of the industrial Internet of Things ecosystem by facilitating workforce collaboration. Contact Babette to discuss how she can bring her programs to life within your organization. Read her book of collaboration hacks, Do YOU Mean Business?, available on Amazon. Image author: boygostockphoto. Image source: Fotolia.